* Google+ requires Picasa Web Albums for photo sharing and Google Talk for chat, so if these services are not enabled then Google+ will not automatically become available, even if your domain has chosen to automatically enable new services. The option to automatically enable new services is controlled in the Domain settings tab of the administrator control panel. More information about using Google+ with Google Apps is available in the Help Center. Update: For Google Apps for Education customers, we're starting with higher ed institutions and are looking into making Google+ available to K-12s at some point in the future. Update 2: The Circles migration tool referenced in this post is now live at google.com/takeout. You can learn more about how to use the tool in the Help Center. Great to see that Google are building a migration tool for Personal/Apps accounts! Finally! Is there any way to transition the data from a regular google account on google+ to a google apps account? Nice work. It only took, what, four months? The server has returned an error. There was a problem communicating with the server. Trying again later only produces the exact same error. I CAN HAZ HALPZ? Great thanks, just waiting for the tool to transfer my old gmail account over to my 'real' account.. I'm very happy to see this finally available. The Google+ Android app doesn't appear to be working with Google Apps accounts just yet though. Please reconsider releasing Google+ to K12 domains. Our K12 school is only using Google Apps for EDU for our staff and could really use the feature. This is great, but the android app does not connect with a connection error? About time... and thank you! Hangout with extras hasn't been working for me. It shuts down --but only for those hangout participants using Macs. Excellent, Thanks so much Google guys! Now all we need is the tool to migrate existing Google+ accounts over to Google Apps accounts! Awesome! I hope the migration tool is available soon. I may have found a bug. The Google+ Android app isn't able to sign in with my GApps account. Thank you for turning this on! The Android Google+ app doesn't seem to work for me. Is this a known issue? Keep in mind, this is not available for K-12 Google Apps Domains and requires your organization to be Higher Ed. Thanks for all your work. I'm having dificulties getting Google+ for my Non-Profit Google Apps account. I am taken to the form for Higher Education Institutions and have filled it out only to be told that this form is not for Non-Profits. My Domain console only has the Education form I have been unable to find the Non-Profit Form. Thanks everyone for your support, excited to get Google+ out to our Apps users! Re: Mobile - It'll be a few more days before the Android and iOS apps get Google Apps support. The web app through the mobile browser has Apps support in the meantime. Excellent! I assume the team who enforce the Real Names policy at regular G+ are being kept *well* away from G+ for Apps? Because their hamfistedness being applied to paying customers would be unfortunate. Love the idea of this. Hope all universities will be using this as it is a great way to interact and improve learning. Unfortunately, it's not available for K12 Google Apps domains. This would be huge for teachers and staff to be able to interact. I can certainly understand keeping students under 18 out of Google+, but having a blanket policy of not allowing ANY K12 domains, this leaves out a huge number of teachers. But tell my why I can still not find Google+ in the Market? Am I correct in thinking that there's no way to merge my google apps G+ account into my existing gmail G+ account such that people can add/share with me on the Same G+ account using either email address? If so, I hope there will be soon! I want to have a single G+ account and use Circles to separate professional and personal contacts as necessary. Having to use two accounts or only one would undermine the basic premise of Circles: poweful audience management. Not working. I successfully switched the Google Plus toggle to "ON" in the domain panel, and successfully saved changes. Google Plus is still listed as enabled. But when an individual user goes to the signup page, the message is "Google+ is not available for your organization." Shoddy. Ugh WHY am I paying for this again? Will the migration tool only be for regular accounts to Google apps accounts or can it also be used from regular accounts to a different regular account? It's not that uncommon to change your email address for various reasons. It would be nice not to have to start over if you switch gmail addresses. We are a K12 Google Apps customer, but we maintain separate domains for our staff, students, and parents. Can we enable Google+ for the staff and parent domains, just not the student domain? So, does this mean that google intends to tell my employees what name they may or may not use when communicating with their coworkers? Hmm, Android app not working for me either. Google will probably roll out an update to the Market soon. Ah, apparently the answer to my question is yes, google does intend to do just that. Thank you, but no: what my employees call themselves is not any of your business. I am also hoping that Google+ will come to K12 with the 18+ in place we can still use it. Our staff is in it's on OU so that we can turn features for staff and not students. With this in place we could allow it to only people over 18. Just a thought!! Enabled on in services and checked the individual user settings. But still disallowed on login. I'm going to check again later, maybe the batch the changes instead of doing it real time. I's the admin for a K12 school, and we could use G+ for just our teachers and admins. Profiles. Really, please just turn on profiles for EDU. I don't care about G+ that much. I don't want to deploy and populate an LDAP server with Sync just to use profiles. "Re: Mobile - It'll be a few more days before the Android and iOS apps get Google Apps support. The web app through the mobile browser has Apps support in the meantime." What about us Non-Profits? I am not sure what to do. I agree with @Nathan... "I'm having dificulties getting Google+ for my Non-Profit Google Apps account. I am taken to the form for Higher Education Institutions and have filled it out only to be told that this form is not for Non-Profits. My Domain console only has the Education form I have been unable to find the Non-Profit Form." Great news, looking for more updates like this in Google+ soon! Google+ app on Android won't allow a sign in from an apps account. "There was a problem communicating with the server." Excelent, already testing it in Apps. One thing that will REALLY help us GA admins is the ability to turn Google+ features on/off for users, ej. games, sharing permissions, etc.... Hope you're working on it. But on the mean time, Thank you!! I'm able to turn Google+ on within the "services" tab, but after enabling Google+, the following message loads when I got to google.com/plus to sign up for it: "Google+ is not available for your organization. Please contact your administrator to enable this service." I still am not able to create a Google Profile as it's not even a available in my services to turn on or off. Is a Google Profile required for Apps users to use Google+? i still can't access my account from iPhone app. Google+ enforces users to use their real identity etc (like you must use your real name). So wouldn't i end up with multiple identities now - one for G+ for gApps and one for my personal G+? Or would there be Syed Rakib Al Hasan in COMPANY and Syed Rakib Al Hasan just as is. Or is it like when i share from G+ for gApps, i only get the additional share with domain.name circle to share with. With the added utility, it's a bit confusing. We have been waiting for month. Thanks for releasing this new feature. Thanks, but it's too late. Great that you say it's available, but how on earth do we make it happen? I've been led through dozens of help articles since I tried to access +. Why doesn't IT JUST WORK? That's where your design / infrastructure team need to pick up their act, Google. I shouldn't need to read help articles to turn the fricken thing on. If you have a Google account and a Google Apps account is it sensible to have a Google+ account for each? Google+ for Google Apps is another enabling tool for facilitating collaboration, enhancing communication, and for further making Higher Education the ubiquitous social living experience it already is. Trying again later only produces the exact same error. Very pleased to see the migration tool in the works - hope it arrives soon! The Android app don't run with the Google Apps account :( waiting for an update! Will it be possible to somehow link my apps account to my personal gmail account? I am also a K-12 admin with separate domains for students and staff. I understand the need to keep the kids off of it, but we would really like to use Google+ on the staff side. A blanket No is kind of a letdown. "I am not able to connect my apps account to the Google+ Android app. It tells me: Oops! We have encountered a problem. The server has returned an error. There was a problem communicating with the server. Please try again later." Wow. I was waiting for this. Thank you. I was soooo anticipating this. We urgently needed an internal collaboration tool with features like Yammer or Chatter but we needed something which was fully integrated with our Google Apps. G+ seemed like the exact solution we needed! Unfortunately, the solution which was released yesterday is so poorly implemented, we can't use it. There are ZERO admin controls for us to control things like global privacy settings or even obvious company-defined circles like "Dallas office" or "HR Department". Without that, every user will have their own definition of "Dallas Office". The other huge issue is that if anyone has a personal G+ account and now adds our Google Apps G+ account, Google doesn't make it easy for their coworkers to tell which is which. Google needs to give a warning when adding an "outside" person to a circle .... just like google Docs does when sharing a document with an outside person. Google. You've got to do a better job at this solution. Were you just too rushed to get something out the door? Or, do you just not get it? I can't tell. FIX THE ANDROID APP !!! Receiving "The server returned an error." for Google+ sign-in for Apps user. Hope near future you guys introduce Google+ fan pages for website and blogs. Why can't Google (who are known primarily as a Search company, make finding its own services easier - or do they not have a facility for reporting problems? Google+ for Android can't login with Apps account: server error. Any updates on when this will be fixed? in my WINEiac.lt free google apps account there is no Google+ toggle in the services tab. What could be wrong? Any word on when the Android app server error issue for Google apps users might be fixed? still waiting for the Android G+ App to work with Apps Users.. Bored of waiting now.. Doesn't work on Google+ iPhone or Android app. Seems like another half-baked Google release :\ I thought Google made some promise to release all future products in sync with Apps users instead of segregating them out a few months back? Like others mentioned, Android app says, "The server has returned an error." The iPhone app says you need a Google+ invite to use the app. Thank you for reconsidering K12 schools. I think it shouldn't be difficult since it's an extra service that is turned on by OU, anyway. A public / private profile switch would be good, too. Any estimate on when the migration tool will be available? I am so glad that Google+ is finally available for Google Apps users. I've been waiting for this since.... ever... :-) Thank you Google! Any word when this will work through the iPhone Google+ app? The migration tool would be much appreciated. @Enrique I have the same issue. Still not working for my .sk domain..
thank you very much, larry and the rest. using google produkts since years, and very happy with all of them. one day people will understand, that plus is not facebook, as we are more professional here. Any reason why Google+ shouldn't yet be available for our Google Apps account? We're a nonprofit (Education) Apps organization, with Google Talk, Picasa Web Albums, Rapid Release, and Automatic add of New Services all enabled. Google+ isn't listed anywhere in our directory of services. Might it be the service hasn't yet hit all Google Apps accounts yet, or is there something we've not yet done to authorize it? Thanks for any feedback/assistance which may be out there. But thank you... none the less! Thanks, guys! Really excited for the migration tool. Tell us when it's ready! Not what Apps admins need. Turned off until the situation improves. Would love to have this migration tool, otherwise I have two Google Plus Accounts! Awesome. Now about that tool to migrate accounts from my 5-year defunct gmail account to my google apps personal email domain? Any word on there being controls for admins to limit the use of this for internal purposes? Our organization could really use something like Google+ but it's definitely something that we would not want our employees posting publicly. Where can I be alerted about the availability of this migration tool for my non-apps account to my apps account? +1 on use for K12 especially for staff. If the control for access could be passed to the domain admins. Don't quite understand why Google couldn't pass this on. Probably in the works but a timeline would be nice because as soon as something new gets released we get hit with "when can we have it" questions. hooray! everyone wants this,cannot wait! So, where's that migration tool? It's been a couple weeks. I want to get notified about the migration tool. I'd like to be alerted about the migration tool also. Any chance you'd do that? It's still not available to apps accounts. What's the holdup? Having 2 G+ accounts (one GMail account which was the only option to use G+ initially and now a GApps account) is pretty frustrating - is there any rough E.T.A. for the migration tool ? Any ETA on the migration tool ? Google, any updates on the migration tool? Is there any way we can sign up for an email update or plus notification? ...also, why do I have to create Blogger account to comment here? Why can't I simply use my G+ account? Still waiting for the migration tool. Anyway to be notified about it? Are there any updates on the migration tool? Will the migration tool only fix the circles or does it migrate all old posts I've done on the old account? 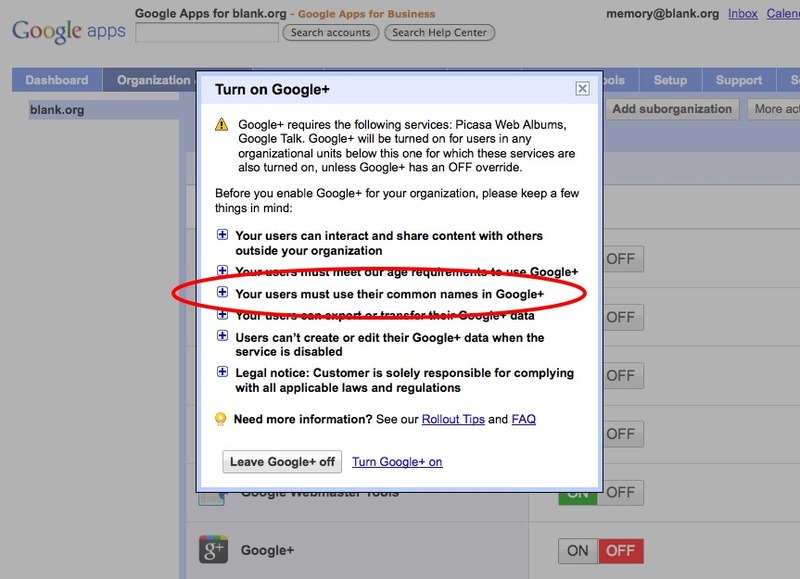 I hope Google plus for Google Apps was restricted to users in that domain etc with more administration. the idea should be that it is the enterprise social network and not a public network like docs / calender. This is from an employer prespetive. Tools like Yammer do that and a integrated Google plus would have made them redundant. Google, any update on the migration tool? Also does the Google+ for Android now work with Google Apps Google+ accounts? I know when Google Apps support was first introduced the Android app didn't work with it. I signed up for Google Plus early on to look around and try it out but I never fully adopted it because it wasn't available for Google Apps. Thanks for changing that! Now, I'm still waiting. This time I'm waiting for your migration tool so I can migrate a bunch of existing circles, etc from my test account. Please add the migration tool soon so I can finally settle in to Google Plus! Still looking for the migration tool. Is it an Easter Egg? What is the hold up on G+ for K-12 schools. Schools don't normally provide email addresses for students so kids under 13 using it is not an issue. It would be a great thing for Faculty to use instead of Facebook...which is public to all the kids, even if they aren't 13. So migration tool? Any time soon? Hanging-on, but growing impatient for the "few weeks" x 3 now. Hope to see it soon and being able to have a solid permanent history of my posts, etc. versus what I'm laying down now which I assume will be lost once I do migrate. Any update on merging Google Plus profiles? Just a quick update on the migration tool. We've been cranking away at it internally (so don't think we stopped working on it! ), and just hit a few bumps in the road that needed time to be solved. The main thing here is for us to ensure that we're properly handling the outgoing and *incoming* edges so it's not something I want to rush out the door. We're almost there! Thanks again for your patience. Are apps-based Google+ accounts limited to ages 18+? What about college students younger than 18? Thank you for the update, Ronald. While you are at it (and considering that you really want to do things right here): Why don't you offer a tool for merging Google accounts altogether? Now, that my Google apps account can finally do all the things only "personal" accounts could do before (Youtube, Google+, ...) and now that there is basically no limit on merging certain services (unlimited Picasa web albums etc. ), I would prefer having only one set of Google contacts, only one set of Picasa/Google+ picture albums, only one set of Gmail folders, only one set of Google Calendars and so on. In short: I would want to press a button and move all my "personal" account data to my Google apps account and leave the "personal" Google account with only a simple email redirect to the apps account. With Google+ integrating across all Google products, a Google+ migration tool seems to be only the starting point for consolidating Google accounts altogether. Also, we just want to use it for staff & faculty at first, couldn't you turn it on for us just like you did for higher ed? Thanks for the update Ronald. I've been holding off on creating any more G+ accounts until I see how this issue gets resolved. I manage multiple free Gmail accounts plus my apps domain and would love to be able to associate them with one G+ account. Altogether I manage something like 8 gmails. The FAX machine in my office even has its own gmail! What I think everyone would really want is the ability to use a G+ profile created through my personal Gmail account and then add additional company emails (Google Apps and ideally any domain) so that my personal G+ profile is part of the company domain and has the ability to share certain info within the domain and other info to only outside the domain. This is effectively what you have with a Apps G+ profile (selecting to share info within domain, circles, etc.) but it really should be the other way around. Although I could migrate a personal G+ profile to an Apps G+ profile, the concern people have is that if they leave a company they lose their G+ profile because they lose their company email. The only alternative I see in the proposed methods is to handle 2 G+ profiles, which is far from ideal. I don't see how it can be that hard to allow someone to add additional corporate/university/etc emails, verify it, and then allow that personal G+ profile to be used within the company domain. I agree, I don't want to migrate my personal account to a G+ apps account, I just want the ability to link the 2 together. Oh for that migration tool - every time I activate an Android phone and have to have 1 account for almost everything, another for Voice (can't move the number) and another for G+ (since I don't want to re-connect with everyone) then I'm reminded that this was promised oh so very long ago. So how far in the future is Google+ for k12 going to be? There is so much potential for use in the classroom. Ok, Google. You said "For those of you who’ve already started using Google+ with a personal Google Account and would prefer to use your Google Apps account, we’re building a migration tool to help you move over." How about an update. Hi, I stopped using Google+ until I can migrate to apps account ... and I am still waiting. When is the Migration tool coming out? I want my old personal gmail account with plus moved or linked to my main google apps account. Why can't Google+ come to K12?! If only for faculty/staff use first? Just gonna throw out a shout for transfering g+ to an apps account. Maybe then people will start using it because they won't have to log out and back in just to +1 something. If you're not going to do it at least make it easy to choose an account on the login page. Every other service I can switch accounts easy. G+ requires me to sign out of all accounts to login. Please give us an update as soon as you can. In your post it said you expected it to be launched in a few weeks and it has been 6 months. I gave up waiting for the migration tool a few weeks ago. I am slowly porting everything over to my Google Apps account. I notified everyone. Only about half the people in my circles moved with me. I got tired of having to use multiple browsers to have to access G+ in one and my email in another. It's been WAY too long for the tool to come out. I'm happily over the hump and not looking back! I too have a G+ set up with my personal gmail account - I'd like to migrate it to my Apps account. Can we get an update? So, err, where's that migration tool? Is the migration tool still vaporware? Is there any way to link a personal Google+ account to a Google Apps account? anyone figure out how to migrate an existing google+ account with a new google apps account? I'm currently migrating all my Google services to a Google App account and haven't found the Google+ migration tool anywhere. Is there a hidden link somewhere for this tool, or isn't ready yet? Does anyone from Google can provide more news about the migration tool? I find pretty annoying to have two Google+ profiles and would love to be able to merge both into one. C'mon guys, there are many people in this ver same situation and you would be doing a service to the platform with the reduction of duplicated content. Jon, are you surprised? It took about as long for them to roll out G+ for GApps in the first place. They're pretty lousy at keeping up with promised release times. Another one waiting for the migration tool. Where is it? Curious to know when the update regarding the rollout for EDU domains was posted. Anyone know of their potential timeline for release to K-12? Dear Google Apps team, could you please release this infamous Migration tool for merging our personal Gmail Google+ accounts with our Google Apps Google+ accounts? When will this be rolled out to K-12? Yes...seriously...9 months is entirely too long for this tool to be produced. Still no account merge? Bummer. A while back we announced plans for a tool that would help you transfer your circles from one Google+ account to another and ensure that your followers are automatically directed to your new, preferred profile. Today, anyone can visit Google Takeout and click “Transfer your Google+ connections to another account”: https://www.google.com/takeout. For more information, check out this help center article - http://goo.gl/WxAEe . Thanks again for being so patient! Will this be coming to K-12 soon? Or do you have an estimated date of when K-12 will have access to Google Plus? when company-defined circles will be available? ?